George Washington Wagner IV stands with his attorneys Richard Nash and Charles Knight at the beginning Friday’s pretrial hearing in Pike Conty Common Please Court. George Washington Wagner IV enters Pike County Common Pleas Court Friday in street clothes with no restraints. A pretrial hearing scheduled for 1:30 pm Friday got underway over an hour later in Pike County Common Pleas Court for George Washington Wagner the IV. 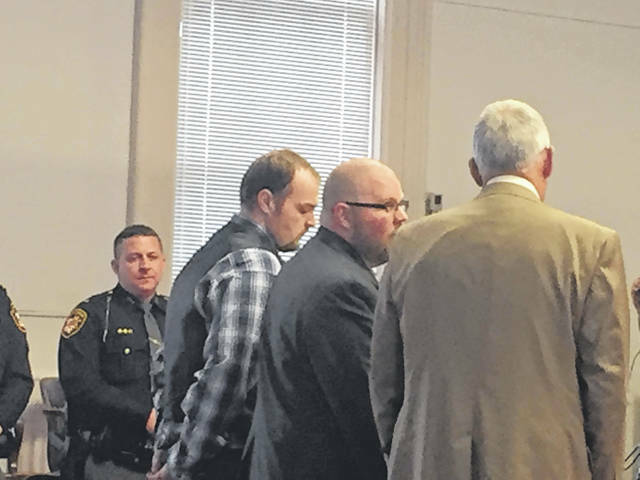 Wagner appeared before Common Pleas Court Judge Randy Deering on a host of charges theat involve eight counts of murder with Death Penalty specifications for the deaths of eight member of the Rhoden family in 2016. Wagner is only one of six of his family who are charged in connection with the murders. His mother, Angela Wagner and father George Washington “Billy” Wagner III, as well as his brother Edward “Jake” Wagner all are facing the death penalty if they are found guilty. Grandmothers Fredericka Wagner and Rita Newcomb are facing charges for allegedly lying to a grand jury. Friday Wagner IV appeared in court in street clothes and without any hand restraints visable. This, according to Deering, satisfied one of the motions defense attorneys had filed on Wagner’s behalf. Deering, on another motion, was concerned about Wagner Iv’s relationship with his attorneys Charles Knight, and local attorney Richard Nash. Deering asked Wagner if he sees and speaks with his attorneys on what he thinks is enough time; does he get along with his attorneys; and does he feel as though he is getting good representation: Wagner IV answered yes to all three questions. A somewhat of an unusual request was made by Wagner IV to be placed in solitary confinement while waiting on his trial. Wagner IV is housed in the Ross County Jail. Pike County Prosecutor Rob Junk told the court where he is placed in the facility is up to the Ross County Sheriff. Deering agreed, saying he wasn’t sure if that was possible at this time because Ross County is doing some remodeling to the jail facility. Usually solitary confinement is given to a prisoner who either is a threat to other prisoners or who may be in danger in the general population. Courthouse security was tight Friday with the back entrance of the courthouse roped off to allow the safe entrance and egress of Wagner IV. The Wagners are charged in the murders of Hannah Gilley, 20; Christopher Rhoden Sr., 40; Christopher Rhoden Jr., 16; Clarence “Frankie” Rhoden, 20; Dana Rhoden 37; Gary Rhoden 38; Hanna Rhoden 19; and Kenneth Rhoden, 44. The Rhoden family was found murdered on April 22, 2016 at four different residences in Pike County. There were small children in the homes whose lives were not taken on that day, including a four day old infant who was reportedly in bed with her deceased mother when found. The children reportedly remain in state care. Court proceeding continue next week in Deering’s courtroom with both grandmother, Newcomb and Fredericka Wagner appearing for pretrial on Thursday and George Wagner III will be in court on Friday for pretrial. Edward is in court for his pretrial the following week. https://www.portsmouth-dailytimes.com/wp-content/uploads/sites/28/2019/03/web1_Wagner.jpgGeorge Washington Wagner IV stands with his attorneys Richard Nash and Charles Knight at the beginning Friday’s pretrial hearing in Pike Conty Common Please Court. 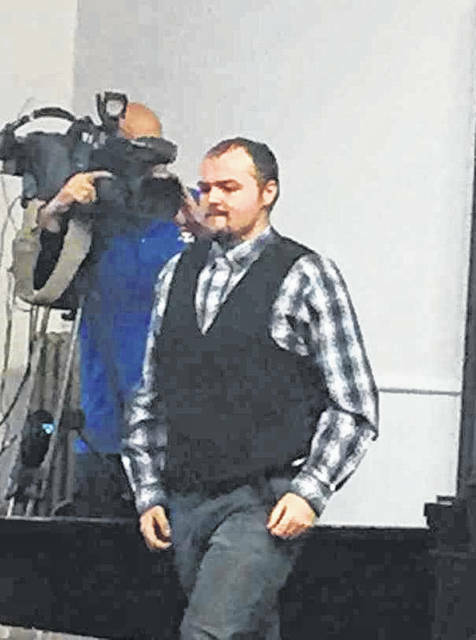 https://www.portsmouth-dailytimes.com/wp-content/uploads/sites/28/2019/03/web1_GEORGEW.jpgGeorge Washington Wagner IV enters Pike County Common Pleas Court Friday in street clothes with no restraints.